GeoSmartDNS might modify system’s DNS settings to inject various advertising content. Thus, it is no wonder it was decided it should be classified as adware. If you ever come across this doubtful tool, you should be aware there is a chance its displayed advertising material could be possibly malicious and might put your system and privacy at risk. Naturally, to avoid any risks, specialists advise deleting the adware before anything goes wrong. Also, it is important to stress the modified DNS settings should be reset in order to ensure the safety of the computer’s network. Of course, to make these tasks les difficult for you we will be adding instructions showing how to uninstall GeoSmartDNS and restore altered DNS settings. Users who need more assistance or would like to ask other questions about the application could leave us comments at the end of the article too. Even though, GeoSmartDNS has a homepage available through this link: geosmartdns.com; our researchers noticed it could still be distributed through other channels as well. The most likely one is bundled software installers which might be spread via doubtful file-sharing web page, pop-up ads, and so on. Keep it in mind, in some cases, bundled installers do not allow to deselect bundled software or even tell about such tools installation if the user does not choose advanced or custom installation settings. Consequently, to avoid adware or other similar threats in the future we would highly recommend paying more attention during the installation process. On the other hand, picking the right application is crucial too. What we mean is before clicking the download button it is not enough to read just the program’s description; additionally, users should look for expert reviews, ratings, and any other information that could help determine whether the chosen software is reliable. What happens if the user installs GeoSmartDNS? Our researchers say it might replace user’s DNS settings to 82.163.143.146 and 82.163.142.148. Unfortunately, to change them back the user has to alter DNS settings manually, which means deleting the adware is not enough. At this point, you may wonder what is wrong with the application changing them and why it is important to get the original settings back? Specialists say DNS hijacking might lead to allowing the threats doing so inject user’s network with possibly malicious advertisements from unknown third parties. Also, the user could be redirecting to phishing web pages designed to trick user into revealing his sensitive data. 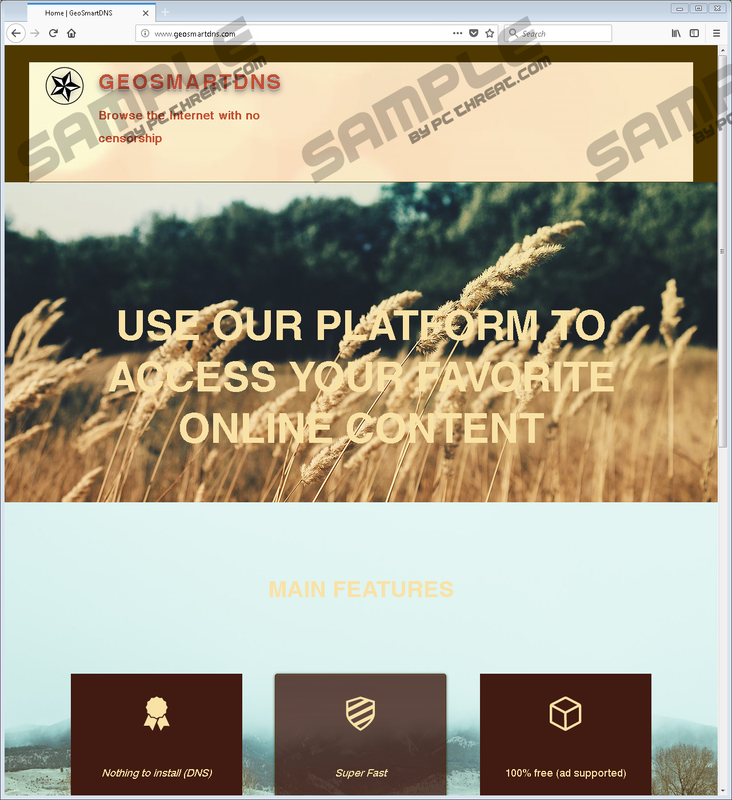 We do not say users will necessarily encounter such advertising material while using GeoSmartDNS, but there is a chance they might and we do not think the software is worth taking it. What’s more, it looks quite unusual the adware settles n by creating folders, tasks, and registry entries that have different titles than the software itself and may not look like they are related at all. Because of this users who choose to erase GeoSmartDNS manually could find it challenging as they may fail to identify the program’s created files. The worst part is the application might select different titles for its other versions and it appears to be there might be quite a lot of them, for example, SHAWNEETOWN, CHEMULT, FERRELVIEW, FRENCHVILLE, MILTONVILLE, VOLIN, JUNCOS, OZONE, AVISTON, STALLO, GREENVILLE, RATCLIFF, SUMAS, etc. Having this in mind we recommend uninstalling the adware via Control Panel instead if you decide you do not want to keep it on your system anymore. Inexperienced users who do not know how to uninstall software via Control Panel could follow the instructions we placed at the end of the text. The other half of them will explain how to reset the modified DNS settings too, so if you have no idea how to complete this task as well make sure you pay close attention to these steps. Click GeoSmartDNS and select Uninstall. Select the adware and press Uninstall. Find the Start menu icon and right-click it. Access the Windows 8 Start Screen. Insert CMD in the Windows Search bar. Find Command Prompt among the results. Go to Start and select All Programs. Click Accessories and find Command Prompt. Right-click it and pick Run as administrator. Navigate to Start and press RUN. Insert cmd and select OK.
Quick & tested solution for GeoSmartDNS removal.